Ace marksman Joe Gormley has netted only once since McLaughlin took over the reins at Solitude at the start of February. But it hasn’t impeded the Reds form as they have picked up 18 points out of 24. McLaughlin believes it’s high time the rest of the team stepped up to take the goal scoring ‘burden’ off Gormley. “It’s important all the boys chip in with goals,” he said. “It was good to see one of the centre halves on the score sheet against Coleraine last Saturday. “We can’t keep relying on Joe and Rory (Donnelly), especially Joe, who has carried the burden of scoring goals for the club for too long. Cliftonville still have an outside chance of nabbing one of the automatic European spots. But McLaughlin knows it will take a big effort starting against Ballymena United this Saturday, who currently occupy second spot in the table. “Ballymena have been fantastic throughout the season,” he said. “David Jeffrey and his staff have assembled a really strong squad. “We’ve saw that throughout the season, they are title contenders and rightly so. “We don’t expect anything less than another tough game. “We’re trying to build momentum as best we can, not just for the play-off but going into next season too. 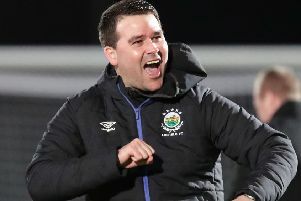 The Sky Blues title ambitions were finally ended last Friday night when league leaders Linfield took all three points at Warden Street. Boss David Jeffrey was disappointed to have taken nothing away from the game after another impressive performance, but he said there was plenty to be proud of. “This is a journey, as I always say we are taking baby steps and incremental strides,” he said. “I’m very proud of how our players have performed. “The boys didn’t crumble after conceding the goal against Linfield last week, they showed great character and resilience to keep going.